New images of Pluto taken during New Horizons' flyby paint a picture of surprising complexity and variety. This synthetic perspective-view of Pluto as it would appear from 1,100 miles (1,800 kilometers) above, built from newly sent high-resolution images, shows a portion of the dark Cthulhu Regio and the smooth plains of Sputnik Planum. An "over-the-top" complex mix of craters, ice flows, mountains, valleys and apparent dunes coexist on Pluto in the latest amazing images from NASA's New Horizons spacecraft. 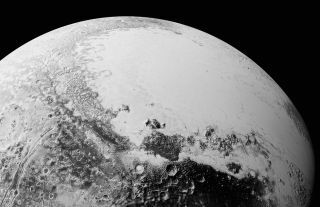 "Pluto is showing us a diversity of landforms and complexity of process that rival anything we've seen in the solar system," New Horizons' principal investigator Alan Stern, from the Southwest Research Institute in Colorado, said in a statement. "If an artist had painted this Pluto before our flyby, I probably would have called it over the top — but that's what is actually there." At Space.com, we combined the new Pluto images into an awesome video. There may be dunes, officials said in the statement, adding that nitrogen ice flows travel from mountains down to plains, and a network of valleys seems to be carved by flowing material. Old, cratered terrain and "chaotically" jumbled mountains border new flat, icy planes in the segments scientists have seen. "The surface of Pluto is every bit as complex as that of Mars," Jeff Moore, leader of the New Horizons Geology, Geophysics and Imaging (GGI) team at NASA's Ames Research Center in California, said in the statement. "The randomly jumbled mountains might be huge blocks of hard water-ice floating within a vast, denser, softer deposit of frozen nitrogen within the region informally named Sputnik Planum." Broken, mountainous terrain is visible on the left edge of the flat, icy Sputnik Planum. The mountains might be blocks of water-ice floating in Sputnik Planum's frozen nitrogen, officials said. The image covers 300 miles (470 km). The flat plains of Sputnik Planum fall within the left side of Tombaugh Regio, the heart-shaped region first seen in July as New Horizons approached the dwarf planet from afar. It was one of the earliest features spotted on Pluto, and is only now revealed in full detail from 50,000 miles (80,000 kilometers) away. Along the border of Sputnik Planum are what look like dark, windswept dunes, an unexpected surprise on a world that has too thin an atmosphere for wind, officials said. The dark ridges in the center of this view, near the bottom of Sputnik Planum, suggest possible windswept dunes. Also visible is old, cratered terrain juxtaposed with new, smooth ground, as well as mountains. "Seeing dunes on Pluto — if that is what they are — would be completely wild, because Pluto's atmosphere today is so thin," William B. McKinnon, a GGI deputy lead from Washington University, St. Louis, said in the statement. "Either Pluto had a thicker atmosphere in the past, or some process we haven't figured out is at work. It's a head-scratcher." Researchers also received more data about Pluto's atmospheric haze. Imaged as Pluto blocked out the sun, this haze formed a glowing halo from the probe's perspective. There are more layers than the data initially suggested, and a soft atmospheric glow illuminates the planet's night side just before sunrise and after sunset. A processed image of the sun shining through Pluto's atmosphere (right, unedited version at left) reveals multiple layers of haze. "This bonus, twilight view is a wonderful gift that Pluto has handed to us," John Spencer, a GGI deputy lead also from the Southwest Research Institute in Colorado, said in the statement. "Now we can study geology in terrain that we never expected to see." New Horizons continues to send back new images and data from the flyby while pressing onward, now over 43 million miles (63 million km) from Pluto and 3 billion miles (5 billion km) from the Earth. Friday (Sept. 11), officials will release detailed images of Pluto's moons, taken during the flyby, that hint at a "tortured" geological past for Charon, officials say. Charon, like Pluto, is proving far more complicated than previously suspected.